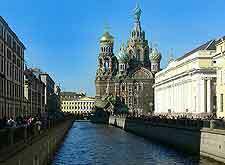 Often referred to by the resident Russians as simply 'Piter' and formerly named Leningrad, St. Petersburg (Sankt Peterburg) has definitely led an interesting past, with over 300 colourful years of history, for more than 200 of which it was actually the capital city of the whole Russian Empire. The present-day St. Petersburg remains an exceptional city in all aspects, more than living up to the dreams of Tsar Peter the Great, who founded the city in the early 1700s. The Neva River and its numerous canals wind their way through the centre of St. Petersburg, being lined with a true showcase of grand palaces and important buildings from as far back as the 18th century. St. Petersburg is where Russian ballet was actually born and has also been the home of many acclaimed composers, such as Sergei Rachmaninoff. Your first port of call for everything to do with Russian tourism, the City Tourist Information Centre lies along the Sadovaya Ulitsa. Various travel agencies are also dotted all over St. Petersburg, with good choices on the Malaya Morskaya Ulitsa and the Nevsky Prospekt. Many of the best sights in St. Petersburg are to be found around the actual city centre and its prominent thoroughfare named the Nevsky Prospekt. Head to the Palace Square, known locally as the Dvortsovaya Ploshchad and appreciate the architecture of the Winter Palace, or spend the afternoon cruising on the city's canals on water buses, stopping of at the Mikhaylovsky Gardens en route. Children will enjoy a day at the historic St. Petersburg Zoo (Sankt Peterburgskii Zoopark), which dates back to 1865 and contains everything from elephants to polar bears, who always enjoy the chilly Russian winters. 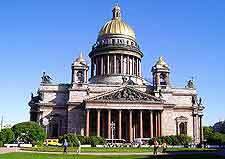 More information about St. Petersburg Tourist Attractions. A wealth of truly wondrous buildings from the 18th and 19th centuries remain well preserved in St. Petersburg and are open to members of the public. These include the Alexander Palace, Anichkov Palace and Menshikov Palace, which interestingly was actually one of the city's very first buildings to be constructed of stone and easy to spot with its yellow and white facade. The riverside Peter and Paul Fortress is amongst the most famous of all the landmarks remaining in St. Petersburg and was founded as long ago as 1703 by Peter the Great himself. More information about St. Petersburg Landmarks. Many of the glorious mansions within St. Petersburg are now home to museums and none come more impressive than the famous State Hermitage Museum (Ermitazh), which was created by Catherine the Great and boasts a collection of over three million items, all of which reside within her imperial residence of the Winter Palace, on the Dvortsovaya Ploshchad. Look out too for the natural history information and exhibits at the Zoologicheskii Muzei, memorabilia from Russian political history at the Muzei Politicheskoi Istorii Rossii, and Russia's largest collection of art at the Gosudarstvennyi Russkii Muzei, better known to tourists as the State Russian Museum. 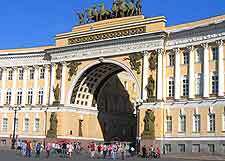 More information about St. Petersburg Museums and St. Petersburg Art Galleries. Numerous extremely rewarding excursions await visitors who decide to make St. Petersburg their base for more than just a few days. Consider visiting the Gatchina Palace, or the Island of Kotlin, where the fortress of Kronshtadt resides in all its glory. Home to the Tsarskoe Selo (Tsar's Village) and its elaborate sky-blue Catherine Palace, an excursion to the town of Pushkin is a must, being less than 30 minutes away. 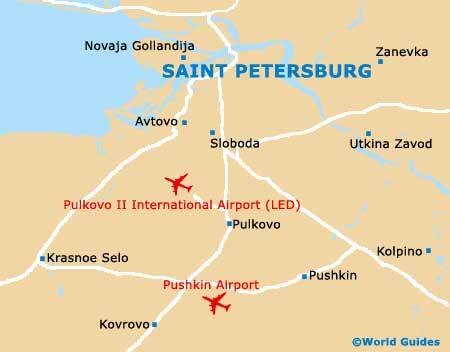 More information about St. Petersburg Attractions Nearby.